As befits any young man with a liberal conscience, and every folksinger, I identified with the underdog, the victim, the unfortunate, the lost and the lonely. I can still identify with them because I have known what it feels like to be all those things. What I cannot identify with any more is the self-pity that goes with it. There is nothing laudable about being a victim. I suppose that life deals us certain cards to play. If we get a lousy hand it doesn't matter; what matters is how we play that hand. We may go through really bad times, be full of sorrow or just plain depressed, but that is our battlefield, that is where we must make our stand. It is so tempting to latch instead onto some other challenge, a social problem, nuclear disarmament or human rights, anti-blood sports or anti-apartheid, all possibly worthy objective in themselves but pursued at the wrong time or for the wrong reasons they can turn us into idiots. "He who would do good" wrote William Blake, "must do so in minute particulars. General good is the plea of the scoundrel, the hypocrite and the liar." It is also the plea of most political ideologues who do not hesitate, and often in the name of "the People", to persecute in minute particulars for the sake of the general good. The idea that heaven on earth is possible through the implementation of a political ideal is one of the most destructive ideas we have ever played with. In seeking to regulate the affairs of man there is still no better point of departure than the Old Testament view that we are creatures who have fallen from grace. I have only to spend a day in front of a television screen anywhere in the world to rediscover that man is a barbarian, and that civilized behaviour is the exception and not the norm. Any ideology that fails to take account of this fact is doomed only to perpetuate the barbarism. As good-doers, or do-gooders, we must ask ourselves whether our main concern is to do good, or to feel good. And I suppose that is why I can't sing this next song any more, not because it is a bad song, or factually untrue, but because it began to inspire a certain feeling of self-righteousness in me when I sang it, especially when singing to the converted. But not to begin with; then, I was just plain scared. I sang it first in 1963 on stage at the Alexander Theatre in Johannesburg. Every night I was afraid that I would hear a shot ring out from the back of the auditorium, or worse, that I wouldn't hear it and would just go down like a sack of potatoes. It was good to sing it then, and I think it was right to do so. It used to split the audience down the middle. It may be hard to believe today but then half the audience hated me for it. (I think half the cast were a little unhappy about it too!) Even those who paid lip service to its sympathies disliked being made to feel uncomfortable. A few years later, Miriam Makeba recorded it in America and included it in her repertoire of freedom songs. She sang it one night in the Albert Hall in London and made a little speech about who had written it. I continued to sing it around the world, when I got mad at being exiled from South Africa, but I became increasingly aware of the pointlessness of my singing it anywhere but where it belonged - at home. Once I could sing it in safety it wasn't worth singing. And when I discovered it was being sung by others with a clenched fist in the air I knew it had been hijacked forever in the service of the general good. and left them to rot on their own piece of ground. and all of them wanting their own piece of ground. and he planted the seed in his own piece of land. and each digger wanted his own piece of land. Fourpence a day for ten tons of ground. on a miserable thirteen per cent of the ground? or you're bound to disturb the white man in his sleep. or your life and your possessions how long will you keep? that the black man's demanding his own piece of ground. In the early sixties Prime Minister Vorster was busy screwing the lid down forever tighter on the cooking pot. It wasn't until P W Botha came along that someone flicked the pressure valve and the steam started pouring out. Today we seek integration as a matter of necessity; in the sixties we did it for fun. There was always an edge of ex-citement that comes with defying the law, but it gave a slight air of surrealism to relationships across the colour line. In any event it was enjoyable, and mixing with black musicians was a great thrill for me. I went to jazz concerts in the townships. They were held in small halls. Not like the big rock concerts of today. You could count the whiteys present on the fingers of one hand. There were musicians like Kippie Moeketsi, Dudu Pakwana, Mackay Davashe, and Dollar Brand who burnt holes with his eyes in white peoples' heads. Ek was bang vir daai een. And I remember driving a young eighteen-year old trumpeter home one night from Alex to Orlando (or was it the other way round?). His name was Hugh Masekela. Many years went by before I was to meet him again, in London, and by then he was famous. Kipple died of drink. Drum Journalist Can Temba went the same way, and Nat Nakasa committed suicide in New York. Lewis Nkosi fared better. He was the first man to take me to a shebeen. He seemed fiercely intelligent, proud and ambitious. I imagine he is doing very well today somewhere, probably in America, but you never know. I liked him. Dollar has gone from strength to strength and to a new name. Even when transplanted, the writing and music of these men remain unmistakably South African, and, in Dollar's case, unmistakably Cape. But I shall never, ever, forget the night I first heard a strolling penny-whistler. He was pacing along Oxford Road in Illovo where I was staying with my first pair of in laws and preparing to go to bed. The magical notes soared like birdsong in the darkness and I could hear them coming nearer. He walked past the house and the music began to recede. I pulled on my clothes and rushed out after him. I must have followed him for an hour or more, reveling in what was the most joyous sound I had heard since New Orleans jazz. 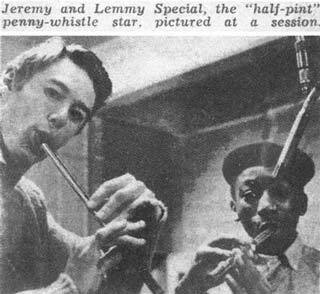 That was 1959 and in the following few years a host of penny-whistle bands emerged from the townships and came wandering through the white suburbs. I learned to play penny-whistle so I could join in with them and had some wonderful times. The musicians, of course, could not believe that a white boy could pull a penny-whistle out of his inside pocket and blow along with them. They would literally roll on the ground with laughter and pleasure. I wrote a kwela song in 1961 and teamed up with Lemmy Special to record it. Lemmy could play in any key on any whistle. He was a genius. It was a privilege to play alongside him. "Ladies and Gentlemen, this is Splits Makhulukhanda speaking! With the help of the King of Kwela, Lemmy Special, I am going to play you my number one hit song of the year - Tsotsi Style!" I wasn't used to town or city ways and this is what happened to me they take advantage of my ignorance and my simplicity and my big wide innocent smile they pretend they's making friends by me pick me pocket in the meanwhile. A guy says "You go work, we cut your throat - Don't you know we's all on strike?" in my stomach tell me, what me do? Tsotsi style, Tsotsi style en duck! Tsotsi style.